Charcoal is used for many purposes since earliest times including art, medicine, and industry. Its advantages for traditional fuel, metallurgical fuel, filtering, adsorbing or grinding-charcoal for black pigment, and medicine for digestive problems. But have you ever heard about using activated charcoal for health benefits? Do you know activated charcoal has many amazing effects that you can apply for skin care? Activated charcoal, also called activated carbon, is a form of small carbon, and usually derived from charcoal. It looks like black powder which the surface area is increased to help facilitate for adsorption or chemical processes. Its sources are plentiful, but the charcoal made from natural derivation like coconut shells and bamboos are more safe and effective when using for health care. What are the benefits of activated charcoal? It can help our body remove toxin substances from the inside out cause of its thousands of tiny pores. Activated charcoal is also famous for poisoning and drug overdose treatments, that why it is used in the emergency in all around the world. Moreover, it helps reduce some undigested problems, decrease cholesterol level, treat hangover and even bile flow diseases. How to use activated charcoal for face? Cause of its adsorption effects, activated charcoal can work well on binding with dirt and toxin from the environment, absorbing oily products, then it helps cleaning your skin. So it can help you get rid of acne quickly. For acne treatment, just mix one capsule of activated charcoal, two teaspoons of aloe vera gel extract to make a mixture. Apply it on your face, gently massage, let it dry by itself and then wash your face with warm water. Do this twice every week until you notice the results. Throughout daily activities, our sebaceous glands work to produce oily products. This sebum accompanied with the dirt and toxins from the environment will clog the hair follicles, then it makes the pore larger. 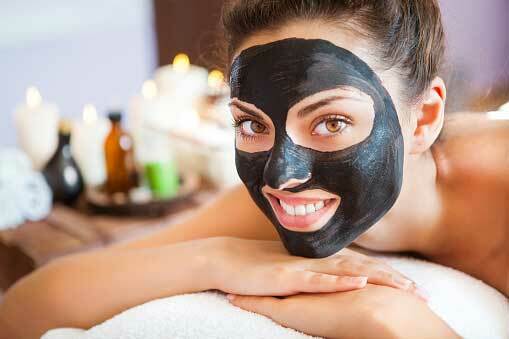 Activated charcoal using a face mask can help pull the plug out and clean your skin as well. The pore size will be smaller and less visible, and that makes your skin face looks fresher and brighter. Just mix 1teaspoon of activated charcoal powder with one teaspoon of rosewater, one teaspoon of honey, and one teaspoon of sugar to make an exfoliating mixture, then apply to your skin face, massage lightly for 5-10 minutes then rinses with water. Repeat it two times per week to get the best result. Activated charcoal will become the great ingredient to balance things out. When it contacts with the dirt or sebum on your face, it will help eliminate the excess secretion, and then balances the PH of your skin, makes it smooth as well. Apply a charcoal facial mask or charcoal cleanser 1 to 2 times per week is appropriate and prevent your skin from dryness. Here I recommend the charcoal facial mask for oily skin: just mix two capsules of activated charcoal, one teaspoon of clay, 1/2 teaspoon of coconut oil, 1/2 teaspoon of water with 1/2 teaspoon of avocado oil to make a paste. Apply the mixture on your face skin and let it there until it dried by itself, wash your face with warm water. Activated charcoal has only natural ingredients so its safe for your all kinds of skin. You can add one teaspoon of charcoal powder with your cleanser to make a deep cleanser mixture but make sure not apply it too often especially with the dry skin or only apply on the oily skin areas for 1 to 2 times per week. Remember to clean it completely. Too much charcoal powder or using it too often can lose the essential oil and the moisture of your skin. You should apply moisture products to skin after applying this remedy. Activated charcoal has great effects on adsorbing so it can help you reject all venom and infection when it is topically applied to the wound or insect bite. When applying as a paste, it can reduce the swelling, pain, and irritation, then improve healing. Simply add water with 1-2 teaspoons of charcoal powder to make a paste then apply to the affected area, let it dries naturally and gently rinse with water. One of the most amazing benefits of activated charcoal for face is fighting blackhead that you can not ignore it. If you are struggling with stubborn blackhead, activated charcoal will be the most intelligent choice. To make a face mask for blackhead: add one teaspoon of activated charcoal powder, one teaspoon of honey, add more some water to form a paste, apply on your skin and let it there for 15 minutes, wash your skin thoroughly with warm water. Repeat it 1- 2 times weekly.